Twenty years ago, after the first democratic election in South Africa, the 1st of May was declared a public holiday. This brought South Africa in line with countries across the world who acknowledge their workforce with this holiday, which is affectionately known as May Day. In this South African Airways, 80th anniversary year, we continue to honour our own employees who strive to ensure a pleasant experience for our entire loyal client base. SAA takes pride not only in our employees, but in the South African nation as a whole. We realise the importance of reaching out to the communities within which we operate to create the awareness of opportunities within the airline industry. These initiatives are driven by the SAA CSI and Events team supported by SAA Technical, Training and Development, Mango and SA Express. The main focus of these initiatives is to create aviation awareness and encourage the youth to consider careers in aviation. It seems the number 80 is synonymous with airlines, according to Professor David Wessels' research from The Wharton School of the University of Pennsylvania. "The majority of travellers limit at least 80% of their travel to airlines for which they have a frequent flyer membership." We therefore appreciate each and every one of you, our loyal members, who make South African Airways your airline of choice. We are delighted to inform you that Etihad Airways has joined the SAA Voyager airline partner family as of 15 April 2014! SAA Voyager Members will be able to earn and redeem Miles when flying on Etihad operated flights. What's more, to celebrate our partnership all SAA Voyager Members will earn Double Miles for flights taken on Etihad Airways between 15 April and 30 June 2014. 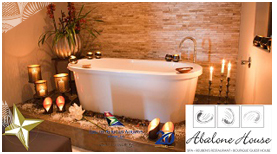 Win a magnificent stay at Abalone House & Spa in Paternoster with Miles For Style! The luxurious five-star Abalone House Boutique Guesthouse effortlessly blends old-world elegance with eclectic decadence in the quaint seaside village of Paternoster on the Cape West Coast. Lavishly designed with luxurious bohemian decor, Abalone House delights with its grandeur, eclectic visual tapestry and divine cuisine. Pristine white beaches are just a stroll away. With its unhindered views of the Paternoster beach, it's the perfect spot to enjoy holiday sundowners! You stand a chance to win a 2-night stay for 2; inclusive of breakfast. For a chance to win this prize please click here and complete the entry form. Win a 2-night stay at Shangri-La Country Hotel - A tranquil haven with Miles for Style! Lush tropical gardens, a trickling waterfall and leafy stone pathways blend with luxurious pampering in en-suite rooms to offer a delightful sense of tranquillity. In the open veld bordering this tranquil country hideaway hotel, monkeys frolic in the trees, while laid-back resident ducks amble around. For couples, friends and families and small groups that enjoy peaceful natural surroundings, finding your own piece of paradise at Shangri-La is just an hours drive from Gauteng. You stand a chance to win a 2-night stay for 2, bed, breakfast and dinner are included in this exciting package. Click here to enter and complete the entry form. Discover the world twice as fast with Hilton Honors. 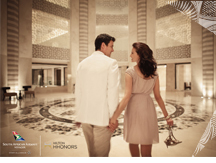 Sign up for the 'Double Your HHonors promotion' and you can earn Double SAA Voyager Miles when you book and stay at any participating hotel or resort within the Hilton Portfolio before 31 July 2014. In order to qualify you must be an HHonors member. Register at HHonors.com/Double before check-out date. Promotion valid between 1 May and 31 July. Your selection of Double Points or Double Miles applies to all eligible stays completed during the promotion period at participating hotels and cannot be changed. For a list of participating hotels, airline restrictions, and the full terms and conditions of this offer, please visit the registration page, HHonors.com/Double. Legacy Lifestyle is Africa's premier Rewards Programme. Earn and Redeem Legacy Rands at over 250 luxury Brand Partners, from fashion to dining to jewellery and hotels. 1 Legacy Rand = 1 South African Rand. 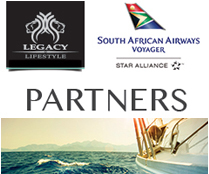 Legacy Lifestyle members can convert their Legacy Rands into SAA Voyager Miles, and vice versa. For a chance to win your share of 10 000 Legacy Rands (LR), register for Legacy Lifestyle at www.legacylifestyle.co.za/saavoyager before 31 May 2014. Plan your next vacation in style with a 5-star luxury stay at Shangri-La Hotels and Resorts. 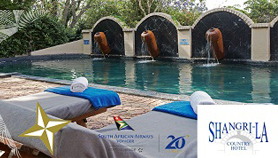 From now until 31 August 2014, you can earn up to 2 000 SAA Voyager Miles for your stay at any selected Shangri-La Hotel, Traders Hotel or Kerry Hotel when booking at the Best Available Rate. To make a reservation, simply book at shangri-la.com or call the Shangri-La worldwide reservations toll-free line. Successfully apply for your SAA Voyager Premium Credit Card, and when purchasing your first SAA ticket on your card, you will receive 19 000 SAA Voyager Miles. Enough Miles for a return MileageKeeper Award to any SAA destination in South Africa! Plus, the more you use your SAA Voyager Credit Card for all your purchases, the more SAA Voyager Miles you will earn. Get your card today and take to the skies. Nedbank Limited Reg. no. 1951/000009/06. Authorised financial services and registered credit provider (NCRCP16). Order your 6-bottle pack of selected wines today with 'Wine Of The Month' for R749.00 and you will receive 1 000 BONUS miles! Plus, ENTER the competition and stand a chance of winning a 6-bottle pack of bubbly valued at R1 146.00. This offer is valid until 30 June 2014. Contact Seeff and stand a chance to win 1 Million SAA Voyager Miles! Click here to find out more about this amazing offer. 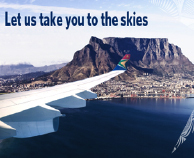 Fly on any SAA International route between 1 February and 30 June 2014 and stand a chance to win an amazing 7-night cruise with Cruises International. This extraordinary prize also includes 330 000 SAA Voyager Miles - the equivalent of 2 SuperPlus Awards to New York. If you book a cruise with Cruises International during this promotion period, you will also receive an additional entry! Airlink has introduced new jet services from Johannesburg to Bloemfontein, Kimberley and Gaborone. These flights will offer you Double SAA Voyager Miles until the end of May 2014. Terms and Conditions apply to the Double Miles promotion. Effective from 1 August 2014, SAA Voyager Members will no longer earn SAA Tier Miles when booking the SAA flight number on the following codeshare Airlines: Emirates, Virgin Australia, Jet Airways, Etihad Airways, Air Seychelles, Rwanda Air, Air Mauritius, LAM Mozambique, Jet Blue and Virgin Atlantic. SAA Voyager Members will still earn Miles when booking on the SAA flight number and when booking on the Airlines where there is a Frequent Flyer Agreement in place. However, these Miles will not count towards Tier Status. Frequent Flyer Agreements currently in place are Emirates, Virgin Atlantic, Jet Airways and Etihad Airways. Mango gives you the choice and flexibility to use your SAA Voyager Miles on all Mango flights, in full or a part thereof. So, this means if you?re paying for a fare and are short on SAA Voyager Miles, the remainder of the cost can be paid using cash or credit card, or one of Mango?s innovative and convenient top-up payment options. Whether it?s from Durban to Cape Town, George or even Zanzibar, with Mango and SAA Voyager you have more choice than ever before. 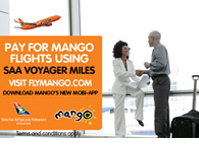 Visit flymango.com or download Mango?s new and improved mobi-app suite and book today! Kindly note that the Airlink and SA Express awards are now available online. After you have withdrawn your award Certificate, please contact our Call Centre or town offices to assist you with the reservation and processing of your Award ticket. SA Express is discontinuing services on its routes between Cape Town and Maputo, and Cape Town and Windhoek from 15 May 2014. The airline has issued a statement saying that the route changes are in support of its focus on sustainability and improving connectivity. Travellers who already have tickets issued for travel after 15 May 2014 will be fully refunded or alternatively accommodated on another flight with a different airline. SAA Voyager and Star Alliance Member airlines value your feedback. As a valued SAA Voyager Member, we appreciate your feedback, as it will help us improve the automated mileage accrual across the Star Alliance carriers to further enhance your seamless travel experience. Avis continues to offer more value to enjoy when you redeem your SAA Voyager Miles for a car rental. For as little as 8 650* Miles per day, you can get a group A vehicle rental. Click here for new Avis Award levels. Effective from 1 May 2014, Tsogo Sun will no longer participate in the SAA Voyager programme. Therefore SAA Voyager Members will no longer earn Miles when staying at Tsogo Sun properties. All transactions that took place prior to the termination date will be honoured in accordance with the retro-claim period of six months. Effective from 24 May 2014, House of Busby will no longer be a partner in the SAA Voyager programme, therefore SAA Voyager Members will no longer earn Miles as of this effective date. Please Remember: When arriving at O.R. Tambo International Airport, Avis drivers will collect you at the arrivals terminal wearing red jackets and holding a name board and will no longer wait at kerbside check-in. SAA Voyager Lifetime Platinum, Platinum and Gold Members travelling from Durban to Dubai on the SA code share number will receive a meal voucher at time of the check-in, due to no International Depature Lounge availability. Please note you will be entitled to one guest meal voucher.